Neuroblastoma is the most common extracranial solid tumor of infancy. It is an embryonal malignancy of the sympathetic nervous system arising from neuroblasts (pluripotent sympathetic cells). In the developing embryo, these cells invaginate, migrate along the neuraxis, and populate the sympathetic ganglia, adrenal medulla, and other sites. The patterns of distribution of these cells correlates with the sites of primary neuroblastoma presentation. Age, stage, and biological features encountered in tumor cells are important prognostic factors and are used for risk stratification and treatment assignment. The differences in outcome for patients with neuroblastoma are striking. Patients with low-risk and intermediate-risk neuroblastoma have excellent prognosis and outcome. However, those with high-risk disease continue to have very poor outcomes despite intensive therapy. Unfortunately, approximately 70-80% of patients older than 18 months present with metastatic disease, usually in the lymph nodes, liver, bone, and bone marrow. Less than half of these patients are cured, even with the use of high-dose therapy followed by autologous bone marrow or stem cell rescue. Histologic subtypes of neuroblastoma are shown in the image below. Histologic subtypes of neuroblastoma. Top right panel, neuroblastoma: A monotonous population of hyperchromatic cells with scant cytoplasm. Bottom left panel, ganglioneuroblastoma: Increased schwannian stroma. Bottom right panel, ganglioneuroma: Mature ganglion cell with schwannian stroma. Over the last 2 decades, many chromosomal and molecular abnormalities have been identified in patients with neuroblastoma. These biologic markers have been evaluated to determine their value in assigning prognosis, and some of these have been incorporated into the strategies used for risk assignment. The most important of these biologic markers is MYCN. MYCN is an oncogene that is overexpressed in approximately one quarter of cases of neuroblastoma via the amplification of the distal arm of chromosome 2. This gene is amplified in approximately 25% of de novo cases and is more common in patients with advanced-stage disease. Patients whose tumors have MYCN amplification tend to have rapid tumor progression and poor prognosis, even in the setting of other favorable factors such as low-stage disease or 4S disease. In contrast to MYCN, expression of the H-ras oncogene correlates with lower stages of the disease. Cytogenetically, the presence of double-minute chromatin bodies and homogeneously staining regions correlates with MYCN gene amplification. Deletion of the short arm of chromosome 1 is the most common chromosomal abnormality present in neuroblastoma and confers a poor prognosis. The 1p chromosome region likely harbors tumor suppressor genes or genes that control neuroblast differentiation. Deletion of 1p is more common in near-diploid tumors and is associated with a more advanced stage of the disease. Most of the deletions of 1p are located in the 1p36 area of the chromosome. A relationship between 1p loss of heterozygosity (LOH) and MYCN amplification has been described. Other allelic losses of chromosomes 11q, 14q, and 17q have been reported, suggesting that other tumor suppressor genes may be located in these chromosomes. Loss of heterozygosity at 11q23 has been described and is an independent prognostic factor. Another characteristic of neuroblastoma is the frequent gain of chromosome 1. DNA index is another useful test that correlates with response to therapy in infants. Look et al. demonstrated that infants whose neuroblastoma have hyperdiploidy (ie, DNA index >1) have a good therapeutic response to cyclophosphamide and doxorubicin. In contrast, infants whose tumors have a DNA index of 1 are less responsive to the latter combination and require more aggressive therapy. DNA index does not have any prognostic significance in older children. In fact, hyperdiploidy in children more frequently occurs in the context of other chromosomal and molecular abnormalities that confer a poor prognosis. Three neurotrophin receptor gene products, TrkA, TrkB, and TrkC, are tyrosine kinases that code for a receptor of members of the nerve growth factor (NGF) family. Their ligands include p75 neurotrophin receptor (p75NTR) NGF, and brain-derived neurotrophic factors (BDNFs). Interestingly, TrkA expression is inversely correlated with the amplification of the MYCN gene, and the expression of the TrkC gene is correlated with TrkA expression. In most patients younger than 1 year, a high expression of TrkA correlates with a good prognosis, especially in patients with stages 1, 2, and 4S. In contrast, TrkB is more commonly expressed in tumors with MYCN amplification. This association may represent an autocrine survival pathway. Disruption of normal apoptotic pathways may also play a role in neuroblastoma pathology. Disruption of these normal pathways may play a role in therapy response as a result of epigenetic silencing of gene promoters in apoptotic pathways. Drugs that target DNA methylation, such as decitabine, are being explored in preliminary studies. Other biologic markers associated with poor prognosis include increased levels of telomerase RNA and lack of expression of glycoprotein CD44 on the tumor cell surface. P-glycoprotein (P-gp) and multidrug resistance protein (MRP) are 2 proteins expressed in neuroblastoma. These proteins confer a multidrug-resistant (MDR) phenotype in some cancers. Their role in neuroblastoma is controversial. Reversal of MDR is one target for novel drug development. Origin and migration pattern of neuroblasts during fetal development explains the multiple anatomic sites where these tumors occur; location of tumors varies with age. Tumors can develop in the abdominal cavity (40% adrenal, 25% paraspinal ganglia) or other sites (15% thoracic, 5% pelvic, 3% cervical tumors, 12% miscellaneous). Infants more commonly present with thoracic and cervical tumors, whereas older children more frequently have abdominal tumors. Most patients present with signs and symptoms related to tumor growth, although small tumors have been detected due to the common use of prenatal ultrasonography. Large abdominal tumors often result in increased abdominal girth and other local symptoms (eg, pain). Paraspinal dumbbell tumors can extend into the spinal canal, impinge on the spinal cord, and cause neurologic dysfunction. Stage of the tumor at the time of diagnosis and age of the patient are the most important prognostic factors. Although patients with localized tumors (regardless of age) have an excellent outcome (80-90% 3-year event-free survival [EFS] rate), patients older than 18 months with metastatic disease fare poorly. Generally, more than 50% of patients present with metastatic disease at the time of diagnosis, 20-25% have localized disease, 15% have regional extension, and approximately 7% present during infancy with disseminated disease limited to the skin, liver, and bone marrow (stage 4S). More than 90% of patients have elevated homovanillic acid (HVA) and/or vanillylmandelic acid (VMA) levels detectable in urine. Mass screening studies using urinary catecholamines in neonates and infants in Japan, Quebec, and Europe have demonstrated the ability to detect neuroblastoma before it is clinically apparent. However, most of the tumors identified occur in infants with a good prognosis. None of these studies shows that mass screening decreases deaths due to high-risk neuroblastoma. Markers associated with a poor prognosis include (1) elevated ferritin levels, (2) elevated serum lactate dehydrogenase (LDH) levels, and (3) elevated serum neuron-specific enolase (NSE) levels. However, these markers have become less important due to the discovery of more relevant biomarkers (ie, chromosomal and molecular markers). In fact, ferritin was not included in the recent formulation of the International Neuroblastoma Risk Group Classification System because it was not found to be of prognostic difference in the high-risk group. Pluripotent sympathetic stem cells migrate and differentiate to form the different organs of the sympathetic nervous system. The normal adrenal gland consists of chromaffin cells, which produce and secrete catecholamines and neuropeptides. Other cells include sustentacular cells, which are similar to Schwann cells, and scattered ganglion cells. Histologically, neural crest tumors can be classified as neuroblastoma, ganglioneuroblastoma, and ganglioneuroma, depending on the degree of maturation and differentiation of the tumor. The undifferentiated neuroblastomas histologically present as small, round, blue cell tumors with dense nests of cells in a fibrovascular matrix and Homer-Wright pseudorosettes. These pseudorosettes, which are observed in 15-50% of tumor samples, can be described as neuroblasts surrounding eosinophilic neuritic processes. The typical tumor shows small uniform cells with scant cytoplasm and hyperchromatic nuclei. A neuritic process, also called neuropil, is a pathognomonic feature of neuroblastoma cells. NSE, chromogranin, synaptophysin, and S-100 immunohistochemical stains are usually positive. Electron microscopy can be useful because ultrastructural features (eg, neurofilaments, neurotubules, synaptic vessels, dense core granules) are diagnostic for neuroblastoma. In contrast, the completely benign ganglioneuroma is typically composed of mature ganglion cells, Schwann cells, and neuritic processes, whereas ganglioneuroblastomas include the whole spectrum of differentiation between pure ganglioneuromas and neuroblastomas. Because of the presence of different histologic components, the pathologist must thoroughly evaluate the tumor; the regions with different gross appearance may demonstrate a different histology. Neuroblastic nodules are present in the fetal adrenal gland and peak at 17-18 weeks' gestation. Most of these nodules spontaneously regress and likely represent remnants of fetal development. Some of these may persist and lead to the development of neuroblastoma. Shimada et al’s original classification was adopted and integrated into the International Neuroblastoma Pathology Classification (INPC). This was most recently revised. The INPC system remains age-dependent. Morbidity of high-dose chemotherapy approaches can be substantial, although the treatment-related mortality rates have decreased with improvements in supportive care and hematopoietic support with growth factors and stem cells instead of bone marrow. Incidence of neuroblastoma is higher in white children than in black children. However, race does not appear to have any effect on outcome. Males have a slightly higher incidence of neuroblastoma than females, with a male-to-female ratio of 1.2:1. Look AT, Hayes FA, Shuster JJ, et al. Clinical relevance of tumor cell ploidy and N-myc gene amplification in childhood neuroblastoma: a Pediatric Oncology Group study. J Clin Oncol. 1991 Apr. 9(4):581-91. [Medline]. Challagundla KB, Wise PM, Neviani P, Chava H, Murtadha M, Xu T, et al. Exosome-mediated transfer of microRNAs within the tumor microenvironment and neuroblastoma resistance to chemotherapy. J Natl Cancer Inst. 2015 Jul. 107 (7):[Medline]. [Guideline] Shimada H, Chatten J, Newton WA Jr, et al. Histopathologic prognostic factors in neuroblastic tumors: definition of subtypes of ganglioneuroblastoma and an age-linked classification of neuroblastomas. J Natl Cancer Inst. 1984 Aug. 73(2):405-16. [Medline]. [Guideline] Cohn SL, Pearson AD, London WB, et al. The International Neuroblastoma Risk Group (INRG) classification system: an INRG Task Force report. J Clin Oncol. 2009 Jan 10. 27(2):289-97. [Medline]. [Full Text]. National Cancer Institute. SEER Pediatric Monograph. National Cancer Institute. Available at http://www-seer.ims.nci.nih.gov/Publications/PedMono/sympathetic.pdf. Accessed: February 25, 2002. Stiller CA, Parkin DM. International Variations in the incidence of neuroblastoma. International Journal of Cancer. 1992. 52:538-543. Haupt R, Garaventa A, Gambini C, et al. Improved Survival of Children with Neuroblastoma Between 1979 and 2005: A Report of the Italian Neuroblastoma Registry. J Clin Oncol. 2010 Mar 29. [Medline]. George RE, Li S, Medeiros-Nancarrow C, et al. High-risk neuroblastoma treated with tandem autologous peripheral-blood stem cell-supported transplantation: long-term survival update. J Clin Oncol. 2006 Jun 20. 24(18):2891-6. [Medline]. Mosse YP, Laudenslager M, Longo L, Cole KA, Wood A, Attiyeh EF. Identification of ALK as a major familial neuroblastoma predisposition gene. Nature. 2008 Oct 16. 455(7215):930-5. [Medline]. [Full Text]. Schleiermacher G, Javanmardi N, Bernard V, et al. Emergence of New ALK Mutations at Relapse of Neuroblastoma. J Clin Oncol. 2014 Sep 1. 32(25):2727-34. [Medline]. De Brouwer S, De Preter K, Kumps C, Zabrocki P, Porcu M, Westerhout EM. Meta-analysis of neuroblastomas reveals a skewed ALK mutation spectrum in tumors with MYCN amplification. Clin Cancer Res. 2010 Sep 1. 16(17):4353-62. [Medline]. Capasso M, Devoto M, Hou C, et al. Common variations in BARD1 influence susceptibility to high-risk neuroblastoma. Nat Genet. 2009 Jun. 41(6):718-23. [Medline]. [Full Text]. Diskin SJ, Hou C, Glessner JT, Attiyeh EF, Laudenslager M, Bosse K. Copy number variation at 1q21.1 associated with neuroblastoma. Nature. 2009 Jun 18. 459(7249):987-91. [Medline]. Wang K, Diskin SJ, Zhang H, Attiyeh EF, Winter C, Hou C. Integrative genomics identifies LMO1 as a neuroblastoma oncogene. Nature. 2011 Jan 13. 469(7329):216-20. [Medline]. Nguyen le B, Diskin SJ, Capasso M, Wang K, Diamond MA, Glessner J. Phenotype restricted genome-wide association study using a gene-centric approach identifies three low-risk neuroblastoma susceptibility Loci. PLoS Genet. 2011 Mar. 7(3):e1002026. [Medline]. [Guideline] Monclair T, Brodeur GM, Ambros PF, et al. The International Neuroblastoma Risk Group (INRG) staging system: an INRG Task Force report. J Clin Oncol. 2009 Jan 10. 27(2):298-303. [Medline]. [Full Text]. London WB, Castleberry RP, Matthay KK, et al. Evidence for an age cutoff greater than 365 days for neuroblastoma risk group stratification in the Children's Oncology Group. J Clin Oncol. 2005 Sep 20. 23(27):6459-65. [Medline]. London WB, Castleberry RP, Matthay KK, Look AT, Seeger RC, Shimada H. Evidence for an age cutoff greater than 365 days for neuroblastoma risk group stratification in the Children's Oncology Group. J Clin Oncol. 2005 Sep 20. 23(27):6459-65. [Medline]. Maris JM, Hogarty MD, Bagatell R, Cohn SL. 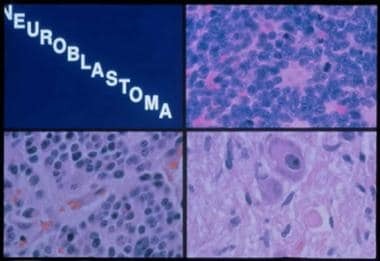 Neuroblastoma. Lancet. 2007 Jun 23. 369(9579):2106-20. [Medline]. Strother DR, London WB, Schmidt ML, et al. Outcome After Surgery Alone or With Restricted Use of Chemotherapy for Patients With Low-Risk Neuroblastoma: Results of Children's Oncology Group Study P9641. J Clin Oncol. 2012 May 20. 30(15):1842-8. [Medline]. Baker DL, Schmidt ML, Cohn SL, et al. Outcome after reduced chemotherapy for intermediate-risk neuroblastoma. N Engl J Med. 2010 Sep 30. 363(14):1313-23. [Medline]. Naranjo A, Parisi MT, Shulkin BL, et al. Comparison of ¹²³I-metaiodobenzylguanidine (MIBG) and ¹³¹I-MIBG semi-quantitative scores in predicting survival in patients with stage 4 neuroblastoma: a report from the Children's Oncology Group. Pediatr Blood Cancer. 2011 Jul 1. 56(7):1041-5. [Medline]. Mueller S, Yang X, Sottero TL, Gragg A, Prasad G, Polley MY. Cooperation of the HDAC inhibitor vorinostat and radiation in metastatic neuroblastoma: efficacy and underlying mechanisms. Cancer Lett. 2011 Jul 28. 306(2):223-9. [Medline]. Federico SM, McCarville MB, Shulkin BL, Sondel PM, Hank JA, Hutson P, et al. A Pilot Trial of Humanized Anti-GD2 Monoclonal Antibody (hu14.18K322A) with Chemotherapy and Natural Killer Cells in Children with Recurrent/Refractory Neuroblastoma. Clin Cancer Res. 2017 Sep 22. [Medline]. Ladenstein R, Valteau-Couanet D, Brock P, et al. Randomized Trial of prophylactic granulocyte colony-stimulating factor during rapid COJEC induction in pediatric patients with high-risk neuroblastoma: the European HR-NBL1/SIOPEN study. J Clin Oncol. 2010 Jul 20. 28(21):3516-24. [Medline]. Agarwal S, Lakoma A, Chen Z, Hicks J, Metelitsa LS, Kim ES, et al. G-CSF Promotes Neuroblastoma Tumorigenicity and Metastasis via STAT3-Dependent Cancer Stem Cell Activation. Cancer Res. 2015 Jun 15. 75 (12):2566-79. [Medline]. Lowry F. Is it Safe to Use G-CSF in Neuroblastoma Patients?. Medscape Medical News. Available at http://www.medscape.com/viewarticle/845310. May 26, 2015; Accessed: March 18, 2016. CT scan of abdomen in a patient with a retroperitoneal mass arising from the upper pole of the left kidney and elevated urine catecholamines. MRI of a left adrenal mass. The mass was revealed by fetal ultrasonography at 30 weeks' gestation. During infancy, the mass was found on the inferior pole of the left adrenal and was completely resected. Before surgery, the metastatic workup was negative. Surgical pathology service confirmed a diagnosis of neuroblastoma. After 3 years of follow-up care, no recurrence was observed. A one-week-old neonate had abdominal ultrasonography for evaluation of projectile vomiting. A right adrenal mass (100% cystic) was an incidental finding. Evaluation of the mass by CT was consistent with an adrenal bleed (3.6 x 3.1 x 2.4 cc). The infant was followed at 2 weeks (2-dimensional size diminished to 1.5 x. 2.4 cm2 on ultrasonography) and then at 6 weeks to document that the adrenal bleed continued to involute. Urine catecholamines were normal. Table. A Consensus Pretreatment Classification schema by the International Neuroblastoma Risk Group (INRG). This schema is based in the INRG stage, age, histologic category, tumor grade of differentiation, MYCN sastus, 11q-aberrations and DNA ploidy. A combination of these characteristics results in four risk groups noted in the last column: very low, low, intermediate and high risk, with the following 5 year EFS: >85%, >75%-85%, >50%-75%, and &lt; 50%. These risk groups are distributed among the different stages and labeled alphabetically from A to R (without letters L and M to avoid confusion with the INRG stage notation). Notations in the table are as follow: L1, localized tumor confined to one body compartment; L2, locoregional tumor with presence of one or more risk factors defined radiologically; M, distant metastatic disease (except stage MS); MS, metastatic disease confined to skin, liver and/or bone marrow in children &lt; 18 months of age. GN, ganglioneuroma; GNB, ganglioneuroblastoma; Amp, amplified; n/amp, not amplified. (Adapted from The International Neuroblastoma Risk Group (INRG) Classifications System: An INRG Task Force Report by Cohn, et al. Journal of Clinical Oncology 27(2):289-297, 2009).